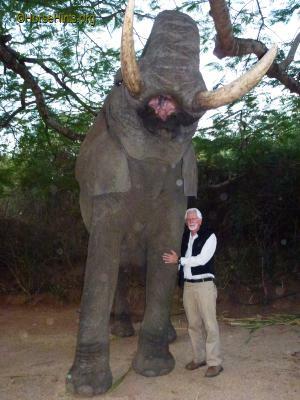 Bill and I had the opportunity to have close encounters with elephants while we were in Johannesburg, South Africa. It was a most amazing and humbling experience. "As numbers of elephants have decreased by some 350% in the last 70 years and by 110 000 elephants in the last ten years (Great Elephant Census) due to poaching and habitat loss, we are honoured to have saved a few. 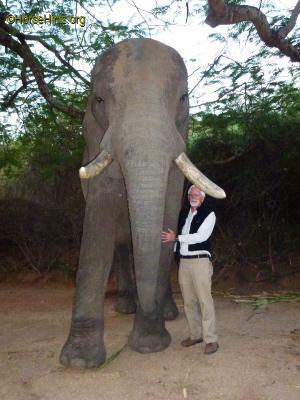 We are even more thrilled to be able to connect you with Elephants through our unique interactions, so that you might see them for what they are, and therefore think a little bit more about their future, and indeed many other species, in an ever changing and modernising Africa. Adventures with Elephants is a place of inspiration and joy. Our beautiful reserve in South Africa is home to many types of wildlife from zebra; giraffe and warthogs; to meerkats. Our biggest privilege is caring for our beautiful African elephants who were destined to be culled. Our latest additions, Zambezi and Bela, were born to mothers Shan and Mussina and are our 6th and 7th family members. More than just a 'touch and feed' activity, our comprehensive interactions aim for each of our visitors to experience, acutely, the intellect and warmth of our gentle giants. Imagine watching an elephant in the wild, or even on television. Now try imagining what the skin feels like, or the tongue, or the surprisingly soft sole of the foot. How about the unique smells. Or the sound of an elephant rumble. Imagine all this whilst experiencing how relaxed, caring and intelligent these animals really are. Our unique hands-on interactions allow you to stop imagining and really get to know elephant better. Our qualified, experienced and friendly elephant guides will introduce you to each of our five elephants, Mussina, Shan, Nuanedi, Chova and Chishuru and show you remarkable aspects of each individual and of the species as a whole. We run a responsible tourism operation that offers the highest level of elephant care, food requirements, hygiene and environmental enrichment. Through playful methods, we guarantee you...the start of a lifetime love for the African elephant and for wildlife. 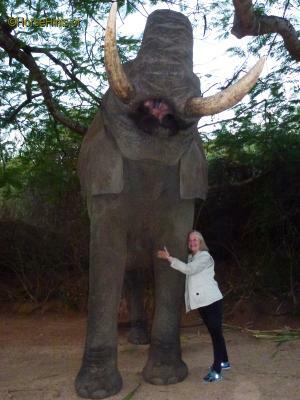 A close, personal and safe encounter with our 7 gentle giants in the hands of our knowledgeable handlers. Our elephants stand under shade on soft mats for comfort. Here you'll learn about elephants from tail tip to trunk tip and everything between, experience first hand an elephant's intelligence through to how acute its sense of smell is, you'll experience their gentle nature as well as the stimulating levels of trust and companionship that can be developed between elephant and man. 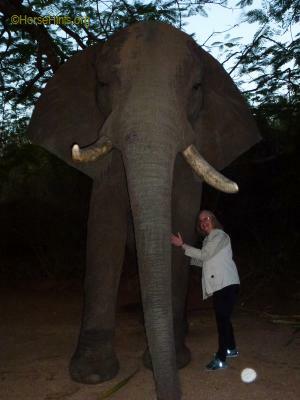 Take part in allowing an elephant to remember your name or identify you by your scent."